I started reading about online marketing about two or so years ago. This year I've decided to try some of it. One of the golden rules is that you should build an email list. It is going to be your asset. You could build a following on Facebook, Twitter or another platform, but if they close down or ban you from it, you lose everything. Email addresses and the trust that you build on the other hand can't be taken away. Hence, it's an asset. I'm using Drip as my email marketing software. You get all features for free up to 100 subscribers. Then it's $49/month for 2500 subscribers. I started with MailChimp because it was advertised as free for up to 2500 subscribers, but as soon as you wanted automation features, it was at least $10/month. And their user interface was not pleasant to work with. It looks like many people didn't confirm their email address for some reason. These are non technical folks, so that was certainly possible. It also doesn't help that Gmail tends to put such emails in the Promotions inbox, and so most people may miss it. The solution obviously is to switch to not using double opt-in forms. But how do you not lose the subscribers up to this point? Support told me there was not way to see the email addresses of those who didn't confirm their subscription, as that would violate the privacy of these users. 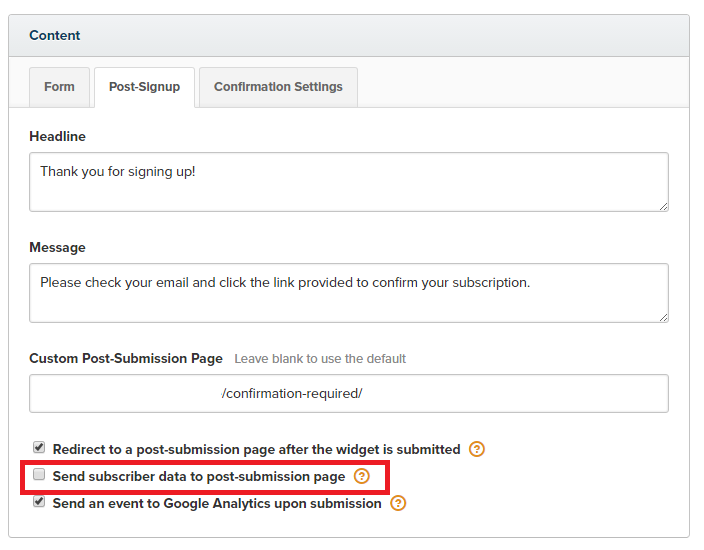 In the form settings, under the Post-Signup tab, you can check to Send subscriber data to post-submission page. But I did not have this enabled. Basically, go to your existing subscribers, click on one. Then replace the ID in the URL with the ID you can see in Google Analytics. Voila! You can see their email, what they did, etc. They will then show up under Subscribers.